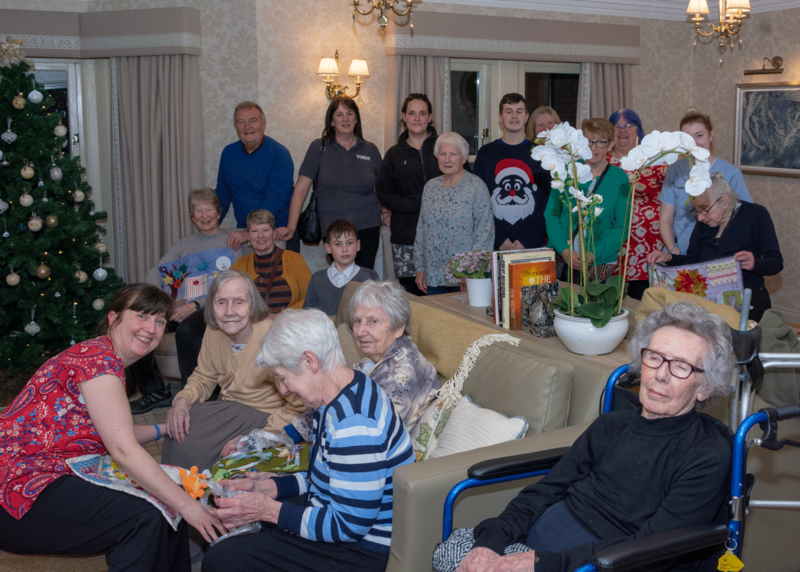 On the evening of Tuesday 18th December a group of young people, and some not quite so young people, connected with YMCA Teesdale visited the Manor House care home to give out gifts of hand-made Fiddle Mats to those living in the Chester’s wing. 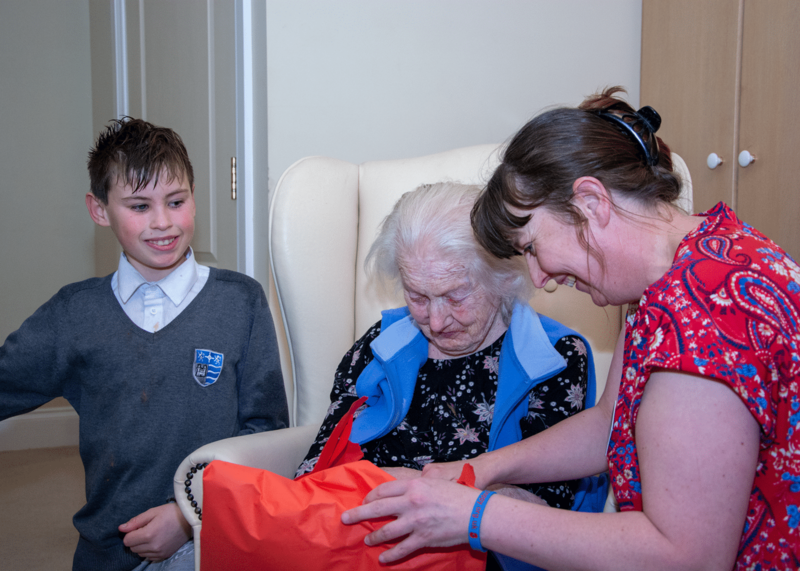 Fiddle mats are an adult version of activity mats, hand-made from coloured and textured fabrics with items attached that can be moved, opened, stretched, etc to keep the hands of those living with dementia active and supple. The idea was brought, via a meeting of the Barnard Castle Dementia Friends Community Group to YMCA Teesdale by Mavis Willoughby – who used to make them before she moved to the town. Over the last few months Mavis has passed on her skills and ideas to a small group of ladies and young people within the YMCA, to begin making fiddle mats which would be distributed to those needing them locally, living either in care homes or with family members. For some years now the YMCA has worked closely with the Manor House with Rebecca Pearson, YMCA youth worker responsible for the intergen project, offering monthly craft sessions where our young people help residents with various crafts. Rebecca has been working with that group to design and plan some fiddle mats. These were then passed on to the group of not quite so young people to do the sewing machine work to make then into sturdy fiddle mats. Sharing ideas, donated resources and enthusiasm during a regular Friday afternoon session at the YMCA, meant that, together, we soon had more than enough fiddle mats to be given out as Christmas presents. 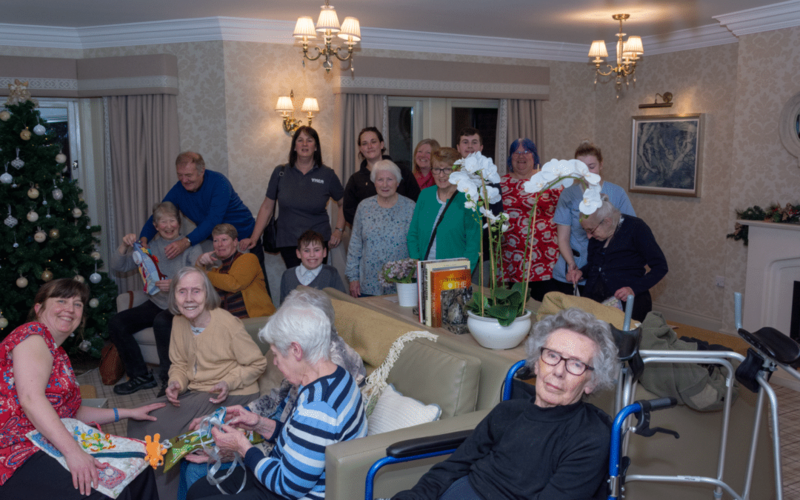 We were made very welcome by the staff and residents of Chester’s, with Catherine Howard, their activities co-ordinator doing the introductions. It was lovely be able to spend time seeing the presents being opened and the mats explored by those receiving them. In the New Year we will get on with making more mats, to be given out in another local care home, probably about Easter time. We also hope to encourage our young people, such as Reece and James (see photos) to learn how to do the machine sewing of the mats with the support of Rebecca and the ladies group.